Go in depth on all the ways the aloe plant kills cancer and fights many other conditions. Download an ebook or order a hard copy today! Your immune system is the cure for cancer! The problem is it doesn’t function optimally. 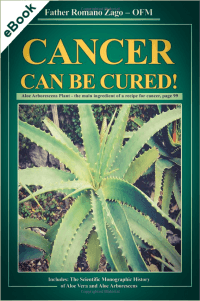 Aloe stimulates the creation of NKCs that kill cancer naturally. 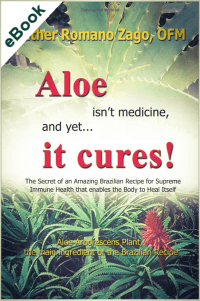 The Aloe Arborescens supreme immune health formula uses just three main ingredients and was originally created by Brazilian natives. They showed Father Romano Zago that cancer can be cured, and he describes how in this books. The Aloe formula is unmatched in its potency to provide the human body a complete spectrum of phytonutrient and medicinal properties that revitalize a dysfunctional suppressed immune system while eliminating toxic waste particles by gently detoxifying the body. This returns the body to its normal and natural state of structure and function. This book provides a natural, scientifically-supported, and low-cost alternative to mainstream pharmaceutical medications as well as a complementary solution to patients undergoing standard cancer treatments who need to maintain a healthy immune system and minimize the side effects. If nothing else, this aloe formula can be a cancer care supplement to help your body cope with chemotherapy and recover quicker.